To commemorate the 150th anniversary of the formation of the Scandinavian Evangelical Lutheran Augustana Synod, more than 100 gathered at Jefferson Prairie Lutheran Church in Poplar Grove, Ill., on Saturday, June 5, 2010. 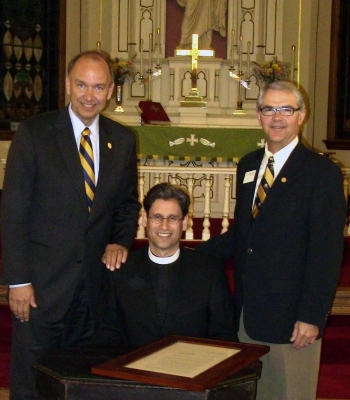 The observation of the founding included a signing of the sesquicentennial compact by (within below photo): President Steven Bahls, Augustana College-Illinois; Rev. Mark Wilhelm, director for Colleges and Universities for the Evangelical Lutheran Church in America, and President Rob Oliver, Augustana College-South Dakota. The compact was signed at the same table used to sign the original constitution creating the Augustana Synod in 1860. President Robert C. Oliver's address to those assembled follows. Thanks to President Steve Bahls and his staff from Augustana Rock Island for all their work and preparations for this celebration. It is most fitting to come together as sister institutions to commemorate this event in our history, and it clearly would not have happened without the support and efforts of our Rock Island sister. Our gratitude is also extended to the members of Jefferson Prairie Lutheran Church for hosting us today. By opening up their church today they have brought both Colleges together to our very roots, the birthplace of Augustana. As Steve has commented, one of the benefits of celebrating the sesquicentennial of our institutions is the renewal of interest in our history. Of course, when one reads the stories of the struggles to persevere and ultimately survive against the odds, not only do we recognize the benefit of learning these stories, but also realize the obligation that our histories present to us as current stewards of our colleges to continue the work begun 150 years ago by courageous and dedicated servants. A couple of us, in particular, have been thoroughly energized and inspired by reading the various accounts of the journey that resulted in the Augustana College in Sioux Falls that we know today. Bob Preloger, our Vice President for Marketing and Communications, and I have had a number of conversations that start something like: Hey! Did you read about what happened when …, or what did you think about this fellow …? In our case, we have a number of locations that are important parts of our story in addition to a number of colorful characters along the way to whom we owe gratitude for our very existence today. Of course the founders struggled mightily after very humble beginnings in the basement of the Norwegian Lutheran Church in 1860 in Chicago and after moving to Paxton, IL, in 1863. Imagine those days when, within the first year of existence, Civil War breaks out and threatens to unravel the entire country. When reading those early accounts, it is apparent that this group of individuals dedicated themselves to a cause much bigger than themselves, and certainly dedicated themselves to the service of both their church and their fellow countrymen. Now when I use that term "countrymen," it is apparent that countrymen had a dual meaning, in that they sought to serve the needs of people from their old country as they struggled their way through life in this new country. In explaining the two Augustana Colleges, I have oft repeated what I had thought to be true: that the reason there are two is because of the legendary inability of the Norwegians and Swedes to get along! What I came to find out is that the faculties of Swedish heritage and of Norwegian heritage were both seriously engaged in the plight of their respective groups, and each had empathy for the other. When they decided to split, it appears it was not because of the Norsk and Swede's legendary incompatibility, but rather of a mutual recognition of the need to focus service to their constituency and the realization that perhaps they needed to do that separately in order to do it best. Once the assets of Augustana were divided, our "Norwegian Augustana" went north from Paxton to Marshall, WI, just east of Madison, where it was named Augsburg Seminary and Marshall Academy. The institution was there for a total of twelve years from 1869 to 1881. But in 1872, it seems it was the Norwegians who couldn’t get along with the Norwegians, so a group split off and headed to Minneapolis to form what is now Augsburg College. In 1881, leaders of what was then called Salem's Seminary in Marshall determined that local needs were largely met by the growing state institution in Madison, and they needed to move westward to keep up with the mass migration into the western frontier. Vast numbers of Norwegian immigrants were entering the United States and moving west to claim land during the homestead era. So the college did the same as it pulled up roots and moved to Beloit, IA, a small community in northwest Iowa on the banks of the Big Sioux River. Members of the community had offered to donate a school building to the college to entice it to come, only to find out that a state law prohibited gifting of publicly owned property to a church-affiliated organization. So members of area churches took up a fund drive and raised the $500 needed to buy the building, and then donated it so that Augustana Seminary and Academy could open there. While in Marshall, a local farmer named Endre Endresen Eidsvaag gave the school a large bell that had been built in a bell foundry in Cincinnati, OH. As the school prepared to leave Marshall for Iowa, a group of individuals sought to prohibit the taking of the bell, and had the local sheriff impound the bell from the rail siding. A legal battle ensued over whether the bell should remain or go with the school. Finally, after two years and a failed attempt to toss the bell into a lake where no one would have it, it was set free to travel westward—I will come back to the story of the bell later. Meanwhile, Augustana was not yet done moving. These were difficult times in Beloit, and the railroad had decided to establish its depot—not in Beloit, but across the river to the north in the community of Canton—in Dakota Territory. After only three years in Beloit, once again Augustana moved, and the community of Canton embraced Augustana College and Academy as an important element in their growing community. Here the institution grew and limped along—I wanted to say flourished—but that would be an overstatement. Again, times were tough in this region—taming the vast Midwest prairie land proved much more difficult than was originally imagined. Ole Rolvaag's book, Giants in the Earth, was written in a cabin not far from Canton. Rolvaag's writing cabin now sits on the Augustana campus in Sioux Falls—a testament to the struggle of the homesteaders to survive and earn a living on the new frontier, hoping to stay the five years so as to earn title to their plots of land. In 1884, The Lutheran Normal School opened in Sioux Falls in a building we now refer to as Old Main. By 1918, it became apparent to church officials that supporting two institutions only 24 miles apart from one another was unwise. Amidst a fair amount of controversy church leaders engineered the merger of the two institutions to create Augustana College and Normal School. The Augustana Academy prep school remained in operation in Canton, SD, as an entity totally separate from the College, ultimately closing its doors in 1971. Augustana College had finally found its permanent home in Sioux Falls, SD. In the words of author Donald Sneen, "when Scandinavians [finally] emerged out of their ethnic cocoon, the sense of constituency broadened, with Augustana enrolling students of many nationalities and different racial backgrounds. Now the college owes its students exposure to and knowledge of cultures that are different from the dominant American culture. A college that is engaged in mission is always on the frontier, for the world is always changing. Yet it remains God's world, and we are ultimately responsible and accountable to Him." Under the leadership of its two longest-serving presidents, Dr. Lawrence Stavig (1943- 1964) and Dr. Charles Balcer (1965 – 1980), Augustana College in Sioux Falls did finally flourish and develop into the fine academic institution that it is today, proud of the highest academic profile in the region and producing outstanding outcomes that proclaim the enduring worth of an Augustana College education. I find myself thinking of the parable of the mustard seed: out of something so small, planted some 150 years ago, has emerged not one, but two fine educational institutions that now serve thousands of students and their respective communities and regions. What a testimony to Christian faith and hope, and true Viking spirit! This indomitable spirit, which prevailed in trials and ultimately led to triumphs, should fortify Augustana supporters as these two colleges forge ahead into the future. I promised to return to the Eidsvaag Bell. The bell continued its journey with the college and now resides in the bell tower of Old Main, a building which, sadly, has become a storage repository and, for the last 40 years, has not been an active building on our campus. Recently a number of us ventured up into the tower and now are planning to remove the bell so that it can once again be rung in celebration for Opening Convocation, Homecoming, Commencement, and other important college events. It serves as a symbol of our history and endurance, and will once again soon ring out triumphantly! Every day is a great day to be an Augustana Viking!